194 pages | 16 B/W Illus. For many years, sports rights owners have had an ‘if you build it, they will come’ attitude, suggesting they take their fans for granted. Combined with advances in broadcasting quality, digital marketing, and social media, this has resulted in diminishing attendances and participation levels. The use of CRM (Customer Relationship Management), BI (Business Intelligence) and Data Analytics has therefore become integral to doing business in sports, emulating the approach used by brands such as Amazon, Netflix, and Spotify. Technology has made the world a smaller place; clubs and teams can now connect with their fans anywhere in the world, allowing them to grow their marketplace, but they operate in an ‘attention economy’ where there’s too much choice and engagement is key. This book sets out to share the processes and principles the sports industry uses to capitalise on the natural loyalty it creates. Case studies and commentary from around the world are used to demonstrate some of the practices implemented by the world’s leading sports brands including clubs Arsenal and the San Antonio Spurs. the governing bodies of UEFA and Special Olympics International, and the MLS and NHL. 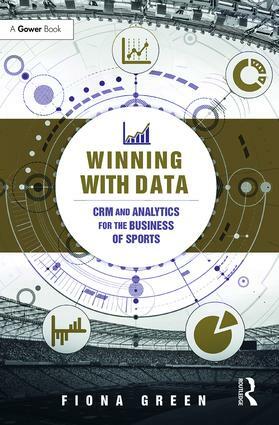 With a focus on our unique challenges coupled with the opportunities the use of data creates, this book is essential reading for professionals within the sports industry. "In a time when we can be swallowed whole by data and what to do with it, Fiona Green gives us a read that we can easily digest. It is a very clear, simple and practical look at the best uses of data to achieve business goals big and small; an excellent primer for those looking to get a better feel or the industry veteran who might have missed a step. One for both the bookshelf and the classroom." - Joe Favorito, Independent sports consultant and author, Columbia University Faculty Member, one of Forbes "50 Sports Business Must Follows", Huffington Post’s "Sports Media People To Follow", and Sports Business Journal’s "Power Players"
Chapter 1 CRM for the Digital Age; Chapter 2 The Principles of CRM; Chapter 3 The Importance of Data; Chapter 4 Business Intelligence and Data Analytics; Chapter 5 CRM Technology Stack; Chapter 6 Data-driven Marketing; Chapter 7 The Role of CRM and Data in Sponsorship; Chapter 8 Business Change and Change Management; Chapter 9 Data and the Law; Chapter 10 Where do we go from here? Fiona Green has worked in the sports industry for 30 years, representing rights owners across sponsorship, TV rights, and merchandise. Fiona moved into the field of CRM and BI over seven years ago and now runs a specialist sports consultancy, Winners, based in Manchester.